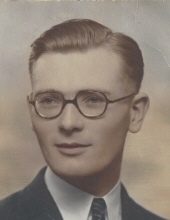 Barnes, Dennis M. - Age 95, of Grand Blanc, formerly Birch Run, died October 18, 2018. He will be interred at the Bloxwich Cemetery, Walsall, England at a later date. Arrangements are being handled by Sharp Funeral Home and Cremation Center, 6063 Fenton Road, Flint. Dennis was born September 17, 1923 in Pachmarhi, India the son of Timothy and Julia (Murphy) Barnes. He served in the British Navy from 1942-1946 in WWII. Dennis married Beryl Richards on September 10, 1949 in Bloxwish, England; she preceded him in death October 15, 2004. Dennis came to the United States in 1956. He worked for Wicks Lumber for many years as an auditor. He was a past president of the Saginaw Valley Kennel Club. He was a world traveler and judged competitions for the Kennel Club around the world. He was a master gardener and loved soccer. Surviving are: nieces and nephews, April (Douglas) Thibaut, Phil (Karen) Walworth, David Walworth; great-nephews, Eric Thibaut, Brad Thibaut, and Kyle Thibaut. He was preceded in death by his parents; siblings, Kathleen Walworth and Patrick Barnes; wife Beryl and nephew Patrick Barnes. Tributes may be shared at www.sharpfuneralhomes.com. To send flowers or a remembrance gift to the family of Dennis Michael Barnes, please visit our Tribute Store. "Email Address" would like to share the life celebration of Dennis Michael Barnes. Click on the "link" to go to share a favorite memory or leave a condolence message for the family.